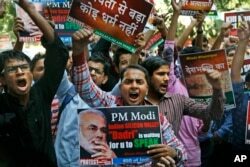 Indian Prime Minister Narendra Modi this week appealed for unity following the killing of a Muslim man for allegedly eating beef and a series of other beef-related disputes that many see as signs of rising intolerance toward Muslims and other religious minorities. Last week Mohammad Akhlaq, a 50-year-old Muslim ironsmith, was beaten to death and his son injured by a Hindu mob at Dadri, 50 kilometers from Delhi, over the rumor that the family ate beef. Without referring specifically to the killing, Modi said during an election in the eastern state of Bihar that the nation will only prosper “when Hindus and Muslims unite and fight” against poverty instead of against each other. “The country has to stand united. Harmony, brotherhood and peace will lead us to development,” he said. Modi’s comments came more than a week after the killing. They followed days of pressure from critics who said his silence following the arrest of some ruling Hindu nationalist BJP party members and cow protection group activists, was worsening tensions between Hindus and religious minorities. While Muslims in south Asia traditionally eat beef, most Hindus revere cows as holy and the slaughtering of the animal is banned across most parts of the Hindu-majority country. 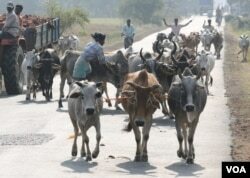 In recent years, in several cases, Hindu vigilante groups attacked Muslims believed to be transporting cows, apparently for the purpose of slaughter. Critics say the rise of Modi’s Hindu nationalist BJP party and its support for some right wing Hindu groups has led to further marginalization of Muslims and other religious minorities. They cite instances of coerced ceremonies where groups of people “reconverted” to Hinduism, forcible separations of Hindu women from their Muslim husbands, and more attacks on cattle trucks. Mumbai-based author and human rights activist Ram Puniyani said that right wing Hindu groups are using the issue of cow slaughter and beef eating to marginalize minorities. “The cow obsession of BJP is a part of a deeper agenda of targeting Muslim minorities as they want to Brahminize the society by creating situations where beef eating becomes a taboo for large sections of society," Puniyani said. Top officials are now pushing back on that sentiment. On Thursday, President Pranab Mukherjee emphasized that tolerance and co-existence are basic tenets of Indian society. Abdul Rasheed said that he had done nothing wrong by serving cow meat to his guests, days after India’s Supreme Court temporarily suspended a ban on the slaughtering of cows and sale of beef in Kashmir while it prepares to decide the matter. The lawmaker said the ruling apparently made little difference to his attackers. “Since they knew that I had not done anything illegal, they did not make a legal move. They pounced on me and hit me on my face and chest the way the hooligans do,” Rasheed said. Television footage showed that members of the People’s Democratic Party (PDP), which rules the state in alliance with BJP, and the opposition National Conference (NC) protecting Rasheed from being assaulted by a group of seven or eight BJP legislators inside the assembly house. “The incident [attack on Rasheed] inside the assembly was unfortunate. I condemn it and I am sorry about it. But I also condemn the hosting of the beef party which was a highly provocative act,” deputy chief minister of Kashmir and BJP leader Nirmal Singh said. Altaf Wani, a businessman in Srinagar, said that in Kashmir the issue of beef has been a very sensitive issue recently. “Beef was not that popular in the past. But in recent months consumption of the meat has increased after BJP started campaigning for a total halt on cow slaughter and sale of beef in Kashmir. 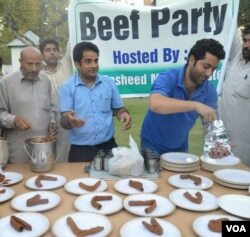 Many Muslims view the ban on beef as an attack to their religious identity,” Wani said. The Jammu and Kashmir high court expects to decide on the beef ban in Kashmir when it constitutes a bench to examine the case in two months.